On March 16, 2013, a fundamental change to United States patent law occurred. The America Invents Act (AIA) first-inventor-to-file (FITF) provisions went into effect. Since that date, any new patent application will be examined under the FITF provisions instead of the previous first-to-invent (FTI) provisions. What does this mean to you or your client as a United States inventor? This alert summarizes five reasons why it is important to file a United States patent application as soon as possible after the invention and before any public disclosure. Reason #1: Another inventor who files a US patent application first may get the patent that you want. Under the AIA, the first inventor to file (not the first to invent) is presumed to be entitled to a patent. Reason #2: Even if another inventor who files a US patent application first does not get a US patent, publication of that patent application may be “prior art” that would prevent your patent from issuing. Under the AIA, US patent application publications are prior art as of the date that they are “effectively filed” (which may include a foreign or domestic priority date). The US Patent and Trademark Office (USPTO) can use such application publications to reject your US patent application that was filed between the effective filing date of the other patent application and that patent application’s publication date (generally 18 months after the filing date). Reason #3: The AIA, unlike the previous patent law, does not provide a way for you to “swear behind” a publicly available document or patent publication to prove that your invention preceded this prior art. This is the result of the change of the law from FTI to FITF. Reason #4: Your or another’s public disclosure of the same or similar invention may be prior art that would prevent your patent from issuing unless you file a patent application claiming that invention within one year of such public disclosure. The AIA provides a one year “grace period” for your own public disclosure, but you might forget to file a patent application within one year. The AIA does not provide a one year grace period to you for another’s public disclosure, unless the other person obtained the subject matter of the invention directly or indirectly from the inventor or a joint inventor (or unless you first publicly disclosed the subject matter of the invention within the one year grace period). Reason #5: Your or another’s public disclosure, even if you file a US patent application within one year, may prevent your patent issuing in another country, which does not have the one year grace period that the AIA provides for US patent applications. However, a US patent application filed before public disclosure of the invention is honored by most countries. This is only a summary of the AIA FITF provisions. There are many other sections of the AIA and the sections have a great deal of interaction. You should contact a registered patent attorney for further information. On February 14, the U.S. Patent and Trademarks Office (USPTO) announced its final rules implementing the first-inventor-to-file (FITF) provisions of the AIA, scheduled to go into effect on March 16, 2013. After a number of comments from stakeholders, the USPTO changed the rule regarding patent applications filed on or after March 16 that claim priority to an earlier-filed application. Previously, the United States Patent and Trademark Office had issued proposed rules implementing the first-inventor-to-file provisions of the America Invents Act (AIA). Among other things, the Office had proposed additional requirements for nonprovisional applications filed on or after March 16, 2013, that claim the benefit of the filing date of a foreign, provisional, or nonprovisional application filed prior to March 16, 2013. According to the proposed rule, if a nonprovisional application contains at any time a claim to a claimed invention that has an effective filing date on or after March 16, 2013, the applicant would be required to provide a statement to that effect. A statement would also have been required if the nonprovisional application does not have a claim to a claimed invention that has an effective filing date on or after March 16, 2003 but discloses subject matter not also disclosed in the foreign, provisional, or nonprovisional application. date on or after March 16, 2013. The Office is also providing that an applicant is not required to provide such a statement if the applicant reasonably believes on the basis of information already known to the individuals designated as having a duty of disclosure with respect to the application that the transition application does not, and did not at any time, contain a claim to a claimed invention that has an effective filing date on or after March 16, 2013. Thus, an applicant in this situation is not required to conduct any additional investigation or analysis to determine the effective filing date of the claims in their applications. Younger patent attorneys and many clients are not aware that the period during which a patent remains in force (the patent term) was at one time 17 years from the date of issue rather than 20 years from the filing date of the patent application. The change was made in Section 534 of Pub. L. 103-465, so that “the term of a patent granted on an application filed on or after June 8, 1995…shall be measured from the filing date of the earliest filed application.” The result is that under the current law, every patent application absorbs all delays that are caused either by the U.S. Patent and Trademark Office (USPTO) or by the applicant, such that the lifetime (20 years from the filing date) of the patent is reduced by any such delays. Statistics from the USPTO’s Data Visualization Center reveal the very real problems that current patent applicants find in obtaining the full 20-year patent term. The change from 17 years from issue date to 20 years from filing date was put into place at a time (1994) when the time from the filing of a patent application to the issue of the patent was much shorter than it is today. For example, the 1995 Inspector General’s Report, Table I, lists the pendency time of the average patent application between 1990 and 1994 increasing from 18.3 months in 1990 to only 19.0 months in 1994. In sharp contrast, the “traditional total pendency” during the eleven months ending November 2012 was 40.7 months as shown in the USPTO Data Visualization Center. Remarkably, the bulk of this time (26.1 months) was time in which the patent applicant was waiting for the first Office Action. This is not a surprise when one considers the increase in the number of patent applications filed and the resulting backlog. In 1994, 185,087 patent applications were filed and 189,646 were “disposed of,” that is, issued or abandoned, so there was apparently no increase in the backlog. In contrast, the application backlog as of September 2012 was 608,283. The USPTO under Director Kappos has made significant improvements in this backlog, but it is still very large. Current patent applicants can expect to wait almost 20 months from their filing date to the first response, or “office action,” from the USPTO. Section 154(b), unfortunately, sets up a “game-playing situation” by the USPTO and the applicant. The USPTO has an incentive to minimize PTA , in order to comply with its mission of speedy patent examination. In contrast, the applicant who experiences very long pendency times has an incentive to maximize PTA in order to preserve as much patent term as possible. Some sophisticated examiners also have a conflict between their management’s goal to minimize PTA and the patent examiner compensation system, known as the “count” system. Under this system, an Examiner is credited with 2.00 “counts” for each application “disposed of,” i.e., issued or abandoned. However, if the Examiner can force the patent applicant to file a Request for Continued Examination (RCE), the Examiner will get an additional 0.5 count and may then get an additional 2.00 counts for each subsequent RCE. Under this system, the Examiner is incentivized to delay patent issuance, while USPTO management is attempting to speed up patent issuance. The USPTO changed the count system on September 30, 2009, so that the counts for subsequent RCEs are reduced. Perhaps due to this change, the backlog of unexamined patent applications has decreased from 716,428 in October 2011 to 608,283 in September 2012. Yet, the Examiner is still credited for each RCE that the patent applicant is forced to file. Applicants may also “game” the system. In some circumstances, the applicant may wish to delay issuance of a patent until the corresponding technology has been commercialized, thus allowing greater returns from a patent infringement suit. The applicant can do this by filing RCEs. However, in some technologies, particularly pharmaceuticals, there is a huge cost to such delays, because the enormous investment in a new drug requires as much patent term as possible to recoup that investment. Alternatively, the applicant can appeal to the newly-renamed Patent Trial and Appeal Board (PTAB). However, this is no quick route to issuance: statistics show that an appeal will increase the pendency of a patent application from 39 months to almost 90 months. If the patent applicant is ultimately successful, the USPTO will award PTA for the time consumed by the appellate review and processing between a notice of allowance and patent issuance – but not if the applicant appeals unsuccessfully. Consequently, after two final rejections, the applicant has no way of knowing whether or not filing an RCE or alternatively an appeal will result in the most preservation of B-delay. To summarize the foregoing, USPTO has an overall incentive to minimize PTA, even though the individual Examiner has an incentive, indirectly, to maximize his or her return by forcing the filing of one or more RCEs. Strangely, the individual Examiner’s incentive maps to the incentive of some patent applicants to delay issuance of a patent, as discussed above. However, one would think that such applicants would be in the minority: most patent applicants want either the patent to issue quickly or to have the patent term extended by any USPTO delays. Statistics from the Data Visualization Center shed some light on the consequences of filing an RCE: “traditional total pendency” increases from 31.7 months (no RCE) to 38.6 months (RCE filed). If 35 USC 154(b)(1)(B) is interpreted to include the time from filing an RCE to a notice of allowance, it would appear that an average of 2.6 months (38.6 – 36) of B-delay would be awarded. But not if the filing of an RCE prevents the accumulation of further B-delay. The recent U.S. District Court (E. D. Va.) case Exelixis, Inc. v. Kappos (Exelixis I) (http://scholar.google.com/scholar_case?case=17511648728905193088&hl=en&as_sdt=2&as_vis=1&oi=scholarr) illustrates how USPTO has interpreted 35 USC 154(b)(1)(B) to minimize B-delay. In that case, the USPTO argued that any B-delay stops accumulating as soon as a patent applicant files an RCE, although it still might accrue A-delay (and C-delay, which I have not discussed). However, in Exelixis I, Judge Ellis found that USPTO’s interpretation of such an “RCE carve-out” is contrary to the law of 35 USC 154(b). This case has been appealed. Incredibly, the same court recently issued a decision in different Exelixis case, (Exelixis II) (http://scholar.google.com/scholar?scidkt=9615730813307455082&as_sdt=2&hl=en) that affirms the USPTO’s interpretation of 35 USC 154(b)(1)(B); Judge Brinkema’s decision is in direct conflict with Judge Ellis’s decision in Exilixis I. This case will probably also be appealed. The result of the appeal could be momentous for patent applicants. If the appeals court upholds the USPTO interpretation, any patent application that is pending with an RCE filed before or after 3 years from the filing date of the patent application will lose the accrual of all B-delay after the RCE is filed. For example, suppose an application is filed on January 1, 2013. If the USPTO does not issue a patent by January 1, 2016, B-delay will start accumulating. Suppose, then, that the patent does not issue until January 1, 2018: the patent term will be extended by 2 years. However, if the patent applicant files an RCE before or after after January 1, 2016, such a filing will stop the accrual of B-delay. Again supposing that the patent does not issue until January 1, 2018, the patent’s term will be reduced by 2 years. For industries such as “big pharma,” huge losses may be involved. One gets the distinct impression that the USPTO operates in a fantasy world in which all applicants and patent examiners do a thorough prior art search so that a correct decision to issue or reject the patent application occurs during the initial filing, without the need for the applicant either to file an RCE or to appeal. 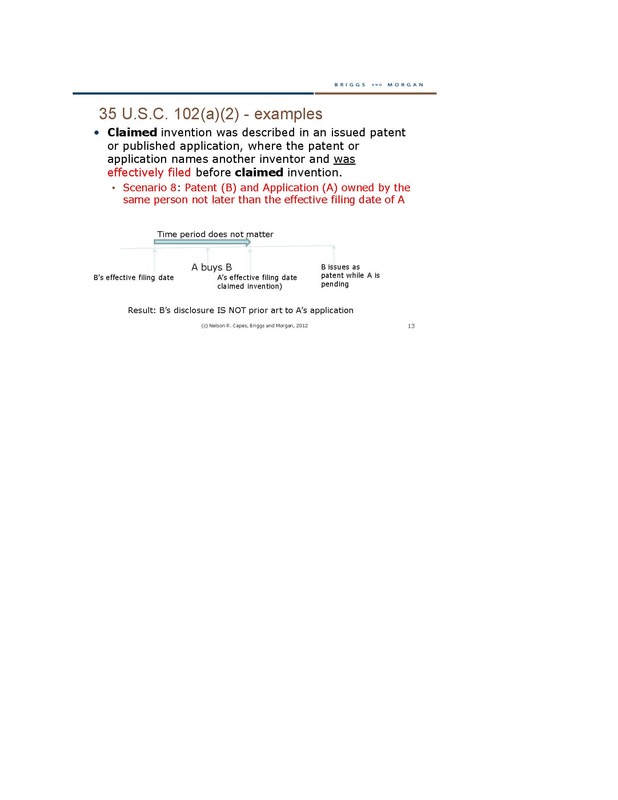 (See Exelixis II: “…such delay emanates solely from an applicant’s original failure to file an application fit for a notice of allowance.”) Therefore, the USPTO apparently views the filing of an RCE as a penalty against an applicant who has intentionally “failed to engage in reasonable efforts to conclude prosecution of the application.” If the USPTO prevails in Exelexis I and Exelexis II, many patent applicants will lose substantial portions of the 20-year patent term that was introduced in 1995. This seems unreasonable given the very lengthy prosecution period now as compared to 1994. The America Invents Act of 2011 contains a number of very important changes to United States patent law. Probably the most discussed change is that of a “first to invent” system to a “first inventor to file” system. This change is implemented in Sections 102(a) and 102(b) of Title 35 of the United States Code, and will go into effect on March 16, 2013. These two sections contain a lot of changes making them significantly different from their current counterparts. It is difficult to read the text of the statute and understand its full impact without going through a number of scenarios. The link in this post is to a Powerpoint presentation that lays out most of the significant timing questions via a number of distinct scenarios. The presentation also includes a number of “take-aways” and practice tips that are immediately significant for applicants to understand even prior to March 16, 2013. Many inventors and businesses believe that they do not need to worry about the “first inventor to file” changes of the AIA until March 16, 2013. Here we show why they need to start worrying about it now. Let’s try to unpack the text and understand the trap. First, the simple case – no trap. Smith files a patent application on March 16, 2013. March 16, 2013 is the “effective filing date.” This is the first such patent application that Smith has filed for the claimed invention. The invention does not claim priority to an earlier-filed patent application. Result: the AIA “first inventor to file” provisions apply. Assuming Smith is the first inventor to file a patent application for the claimed invention, Smith will be entitled to a patent (providing, of course, that the invention is patentable under other provisions, such as novelty and nonobviousness, not successfully challenged under the post-grant review provisions of the AIA, or other possible reasons for unpatentability). Under the Patent Act of 1952, as amended, in effect through March 15, 2013, a patent applicant could claim priority to a previously-filed patent application, as long as at least one inventor of the current patent application was named in the previously-filed patent application and the current patent application contained a reference to the previously-filed application. If both the effective filing date and the priority date of the current application are before March 16, 2013, the “first to invent” law that most inventors and businesses are familiar with will apply. However, under the AIA, Section 3(n), if even one claim in the current application is not entitled to a filing date before March 16, 2013, all of the claims will be treated under the new “first inventor to file” provisions. So here is an example of the trap. On August 1, 2012, Smith (thinking that he does not need to worry about the AIA “first inventor to file” changes), files patent application A. Application A contains only one claim, with three elements, (a), (b), and (c). Elements (a) and (b) are thoroughly described in the patent application, but the description of element (c) is not very good. Smith plans to do some more experimentation on element (c). Patent application A receives an effective filing date of August 1, 2012. On March 16, 2013, with the experimentation on element (c) complete, Smith files a new patent application B with exactly the same claim with exactly the same elements: (a), (b) and (c). The new patent application B contains a reference under 35 U.S.C. 120 to the previously-filed application, A. If Smith had filed application B on March 15, 2013, Smith would not have gotten an effective filing date for claim 1 of application B of August 1, 2012, because element (c) was not adequately described in patent application A. But it might not matter. If someone else filed a patent application C before Smith’s filing date, and the other application C was not a statutory bar under 35 U.S.C. 102(b), Smith could “swear behind” the other application C by showing that he, Smith, invented the claimed invention before the filing date of the other application C. Thus, Smith could have taken advantage of the “first to invent” law. However, when Smith delays only one day, until March 16, 2013, to file application B, he has fallen into the trap. Elements (a) and (b) receive a priority date of August 1, 2012. But element (c) receives an effective filing date of March 16, 2013 because it was not adequately described in application A. This puts all of claim 1 (and any other claims) under the “first inventor to file” law. Now, Smith can not “swear behind” application C because “first inventor to file” is in effect. Smith does not get a patent on application B (unless Smith can show by the new “derivation proceedings” that the inventor of application C derived the invention from Smith, or unless Smith and the other inventor were both obligated to assign their patent applications to the same person). Note also that Smith can’t cure this situation by deleting element (c) of claim 1 before a first Office Action citing application C, because the AIA applies to any patent application that contained at any time a claim with an effective filing date on or after March 16, 2013! Inventors who file patent applications in the United States need to be aware of this trap. Smith either should have done enough experimentation to support element (c) in patent application A as of August 1, 2012, or Smith should have filed application B as soon as the experimentation on element (c) was complete but before March 16, 2013. The moral of the story is: file early and file often starting now. Tags: "effective filing date", AIA, AIA "effective filing date"
This week we kick off a series of posts related to criminal laws and intellectual property. We’re going to examine the current state of IP-related criminal laws–both state and federal. A good place to start is a working paper, The Puzzle of Criminal Sanctions for Intellectual Property Infringement, by Irina D. Manta. Sections II and III of the paper are an effective primer on the history and current state of criminal sanctions in IP laws. For more on federal prosecution efforts, check out the DOJ’s Computer Crime & Intellectual Property Section.